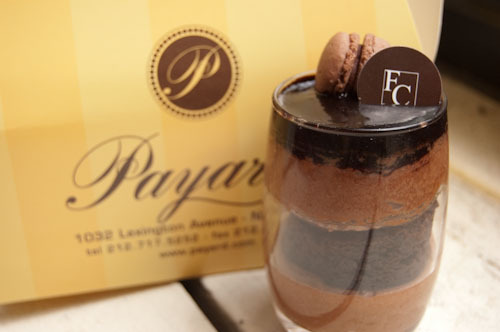 Despite having already tackled two small pastries from Francois Chocolate Bar earlier in the day I decided to “take one for the team” and have another dessert at A Voce. I’m glad I did. 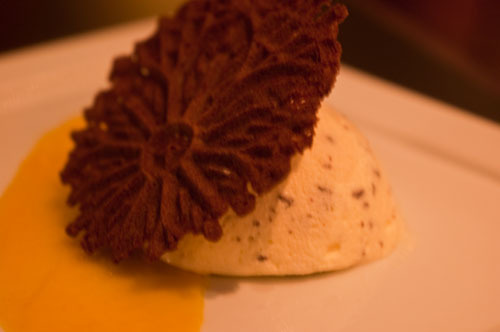 The not-too-sweet, cool, chocolate chip semifreddo was perfect for a warm sultry night. Semifreddo is basically a partly frozen mousse. It’s cold like ice cream but much lighter and just as flavorful. The semifreddo contained nice dark chocolate chips and the dessert was set in a small pool of bitter orange preserve/syrup. The syrup cut the sweetness nicely. The finishing touch was a cocoa flavored pizzelle (waffle cookie). A Voce’s Dessert menu is here. A Voce has 2 locations: One in the Time Warner Center the other at 41 Madison Ave.